Book your fitness classes with ease. Book (or cancel) your fitness classes any time and get notifications of up-coming classes with the GymSync App. 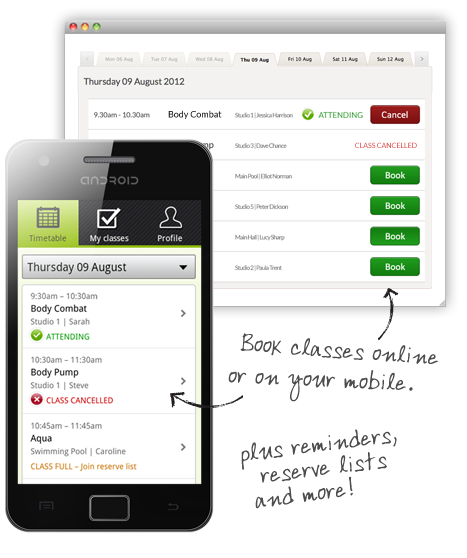 Sign up to GymSync and you can book and manage your classes easily online and with the GymSync app. Can't find your Gym, Let us know! The details you provide during registration will be shared with any gyms or fitness instructors that you decide to connect with. They will use this information to identify you and allow access to their classes. You can change this information at any time via the app or website as well as withdraw your consent to share this data.